Jill Schiller walks in a Memorial Day Parade in Milford May 31, 2018. Not just because it is a traditionally Republican district. Or because it is a geographical nightmare of a district, ranging through southern Ohio from the urban and suburban eastern half of Hamilton County about 150 miles to the east to the Appalachian foothills of places like Pike and Scioto counties. 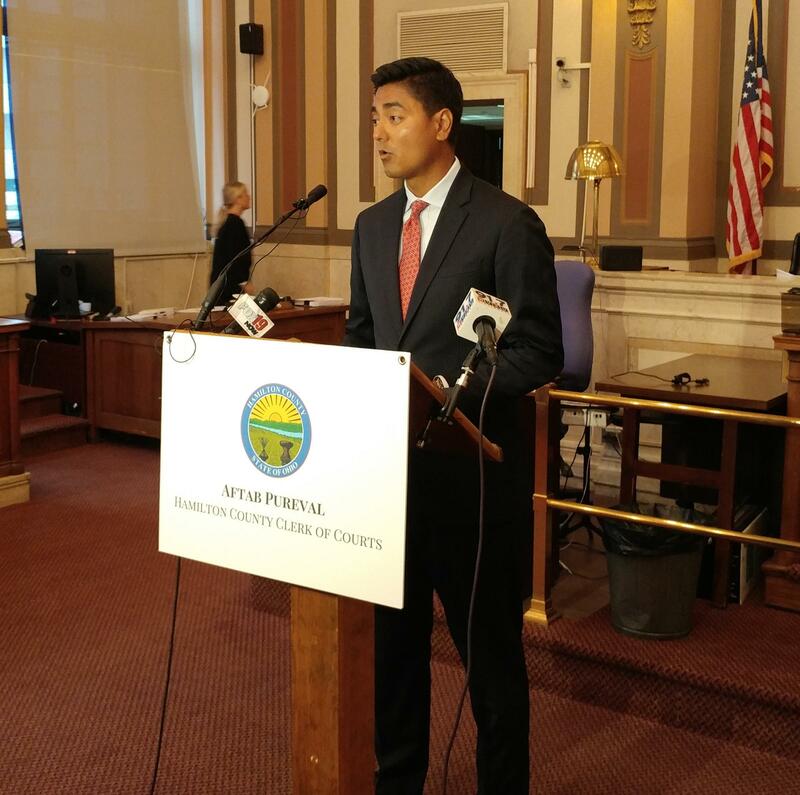 It's tough mainly because, right next door, in Ohio's First Congressional District, southern Ohio's favorite rock star candidate, Aftab Pureval, is taking on incumbent Republican Steve Chabot. It seems like it has been all Aftab, all the time. The 24-hour-a-day Aftab Channel. Aftab this. Aftab that. Aftab's campaign got put on the Democratic Congressional Campaign Committee's "Red to Blue" list. Aftab walks into rooms full of Democrats and is immediately surrounded by fans who want to shake his hand and worship him. But Jill Schiller has her own campaign to run. She must find a way to break through the Aftab noise and find a way to get her message out over this geographically massive district. Schiller, who lives in Hyde Park with her husband, Josh, their two cute kids and a dog named Rocco, has a résumé that is far better than most of the Democratic candidates who have run and lost in this district over the past 30 years or so. In 2009, the Philadelphia native served in the Obama administration's Office of Management and Budget. She practiced law in her hometown. She moved to Cincinnati in 2011 when her husband took a job with a local health care company. She went to work as senior vice president of operations at Downtown Cincinnati Inc. (DCI), and later started her own business, The Schiller Consulting Group, which helps local non-profits with strategic and management services. And, now, she wants to go to Congress. "The people in this district deserve a representative who represents their interests,'' Schiller said. "Brad Wenstrup has so clearly represented the interests of Donald Trump and the Republican leadership in Congress." 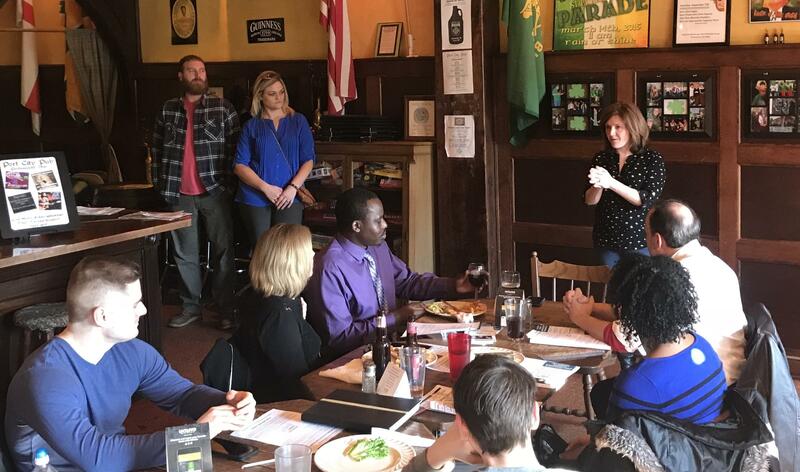 Schiller knows her opponent has put up some impressive numbers in his last two re-election bids – 65 percent and 66 percent. But she also believes he's never been challenged by a serious, well-funded Democrat. Two years ago, for instance, Wenstrup's opponent was a long-distance truck driver named William R. "Butch" Smith – who never campaigned, didn't appear in public and apparently didn't spend a plugged nickel on the race. Still, Smith, the "ghost candidate," won 35 percent of the vote. He did even better when he was Wenstrup's opponent in 2012, with 41 percent of the vote. Wenstrup's road to Congress was an unusual one. He is a doctor of podiatric medicine who accepted an officer's commission in the U.S. Army Reserve Medical Corps in 1998. In 2005, he was deployed to Iraq as a combat surgeon and he still serves as a colonel in the U.S. Army Reserves. 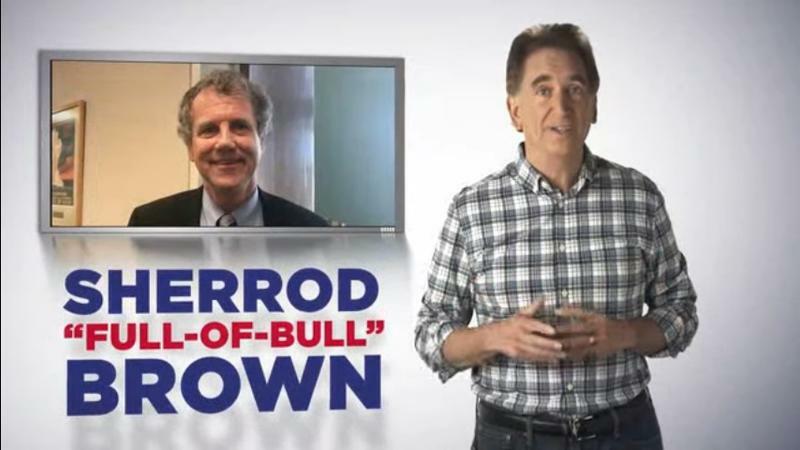 In 2010, the Hamilton County Republican Party was desperate for a Cincinnati mayoral candidate. All the big-name politicians had taken a pass on running against Democratic incumbent Mark Mallory. But Wenstrup stepped up and, while he lost, his performance was strong enough that the GOP looked at him as a rising star. Two years later, he jumped into the GOP primary in the Second District, challenging incumbent Republican Jean Schmidt. To the surprise of many, Wenstrup beat the controversial Schmidt. The GOP establishment shed no tears over her departure. He went on that fall to beat the "ghost candidate" and has had no trouble being elected ever since. Wenstrup has a well-deserved reputation as a nice guy; once they meet him, people generally like him. But, Schiller said, being a "likeable guy" and being a good representative in Congress are two different things. "It will be hard for people to like him when he votes to kick 70,000 people in this district off health care,'' Schiller said. "Good people don't stand by and let this happen." Schiller also says that Wenstrup is rarely seen out in the district. "That will not be the case if I am elected,'' she said. Mark R. Weaver, a long-time Republican campaign consultant who is working for Wenstrup's re-election, told WVXU that while Wenstrup is confident he can win another term, "we take anybody seriously who is running against us." 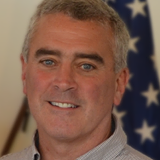 Weaver said Wenstrup is "constantly" in the district, but will begin campaigning in earnest around Labor Day, the traditional start of the campaign season. "If it is a matter of seeing Brad in the district, beginning about Labor Day, he will be everywhere,'' Weaver said. "Right now, he is busy doing his job." 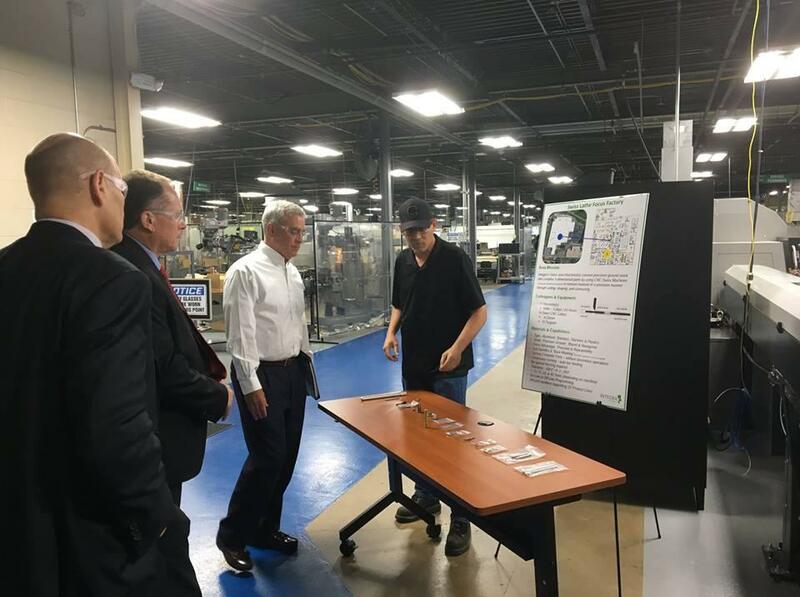 Brad Wenstrup (center) met with southern Ohio business owners June 4. It is a job, Weaver said, that has gotten bigger since the House leadership assigned him to two of the most high-profile committees – Intelligence and Ways and Means. "This is a big district, and I think there are parts of it Jill Schiller has never seen,'' Weaver said. "We're going to be everywhere, all eight counties. We'd be happy to compare the odometer on our car with hers any day." Schiller said she is going to take her message to the Second District voters who voted for Donald Trump in 2016 because "they felt like they had been forgotten. That no one cared about their problems. Well, I do." Now, the challenge is to raise the money to get her message out. Wenstrup has raised over $3 million for his first three runs for Congress. Clearly, she is serious about this. 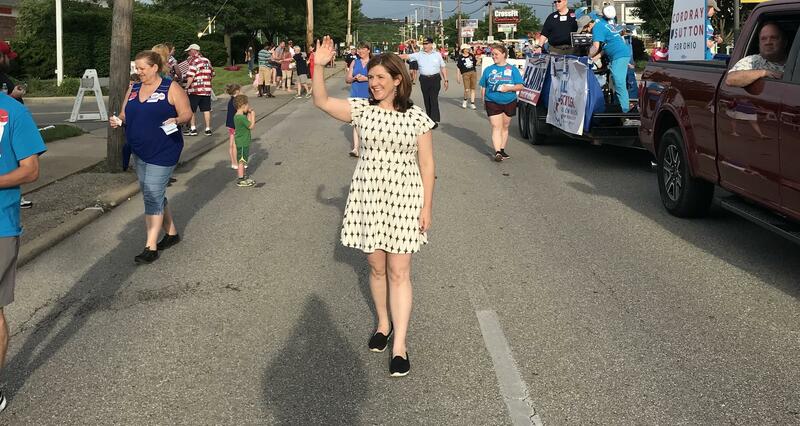 When she called WVXU Monday, she was in Washington, D.C., where she said she was meeting with party officials and people from EMILY's List, a national organization which raises money for pro-choice Democratic women candidates. "We're not going to be out-worked,'' Schiller said. "If Brad Wenstrup wants another term, he's going to have to earn it." Cincinnati Congressman Brad Wenstrup, who was a combat surgeon, was pressed into action Wednesday morning during the shooting at the Republican congressional baseball practice in Alexandria, Va.